"Phsthpok (the Pak). A Protector. Humans are, according to Larry Niven, descended from the Pak. It is a fighting machine "with armour-like skin, super-human strength and super-human intelligence". Far more intelligent than ordinary humans. But this super intelligence serves only to protect its bloodline at any costs. "As everyone knows, the "classic" view of the Alien in Science Fiction is that of "Little Green Men" who carry ray guns that are a threat to humanity; have a different ethos to the rest of us and generally spell trouble and - being British - for me conjured-up childhood memories of Eagle Comics and Dan Dare and the Mekon." 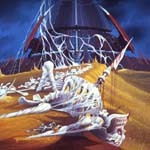 "Completed on the 16th September 1978, by this date my Science Fiction work was selling extremely well and the Publisher of the Niven Books, in the UK and Commomwealth market (Futura Publications) was increasingly supportive of my work because the sales figures were enviable, a result of my illustrative approach which was loosley based around the idea of representing cliches and classic SF concepts in a more plausible modern way. However, in the case of the Protector Artwork I was of the view that even with the reputation I had gained, the Publisher would baulk at my cover proposal - futher exascerbated by the rumour emanating from New York that a "green" SF cover produced by one of the notable American Artists of the time had been a commercial failure, the logic being that "Green" covers were synonomous with bile, puss, puke etc. "In my gut I felt this was nonsense because British TV adverts were showing cows munching on green grass for a famous butter manufacturer. So, I rang the Art Director Patrick Mortemore, who I'd gotten to know well and took a risk and said: "If I show you what I am going to do (in a preparatory visual) you won't let me do it - but I'm convinced it will work so - I will do the picture without showing you and when I bring it in, if you reject it, I'll paint whatever you suggest." I did not go out of the Studio for a whole week and when I took the painting to the Art Director he liked it immediately and from then on whilst it was hardly the last time I took such risks or caused Art Directors anxiety, I do not recall ever having to submit preparatory visuals ever again (though I always produced them for my own purposes). 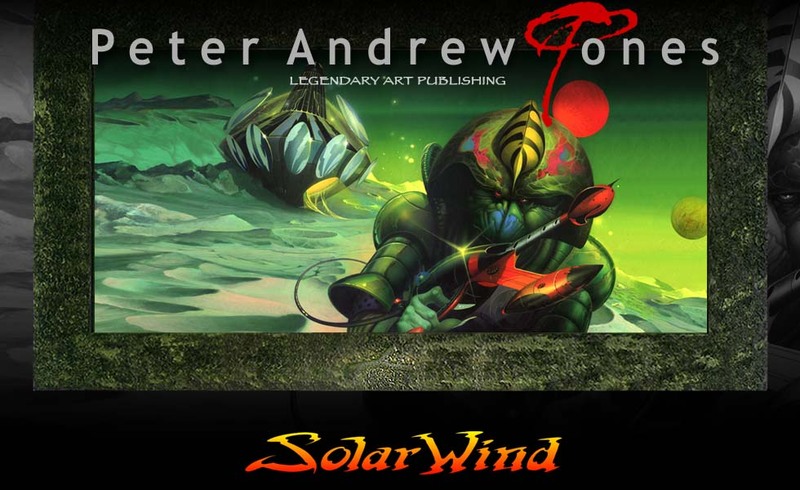 The picture has been a commercial success as a significant image in our SOLAR WIND PICTURE LIBRARY. 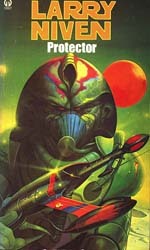 "Protector" was published by Futura Publications - a 1973 novel by Lary Niven, set in hos KNOWN SPACE universe. Peter did the cover for the UK & Commonwealth market edition, one of a series of books on the Paks and their history - boos that are literate and visually well described - and amusing. Well worth a read.